In the previous post we discussed the two winners of European Product Design Award in the category of Bedroom Furniture & Accessories. But there is one more Silver Prize Winner that deserves a special mention: ZEEQ Smart Pillow designed by Warrick Bell, Miguel Marrero and Jared Bell for REM-Fit Company. The key idea was to make a pillow an active participant and assistant in your sleep – an assistant that will help you fall asleep, analyze your sleep, intelligently wake you up in the morning without disturbing your partner and protect you from snoring. All these features can be found in ZEEQ. How often the best pieces of design emerge in a simple effort to improve our daily living conditions. The story of ZEEQ is also just an episode of daily life of its creator. He always needed music to fall asleep, while his wife needed absolute silence. One night he took a pair of wireless headphones and put them inside his pillow. He was surprised to find out that he could hear the music and his wife couldn’t. That’s how the concept of a pillow with built-in high-precision speakers was born. And it took another 3 years to make out how to make it even better and more functional. 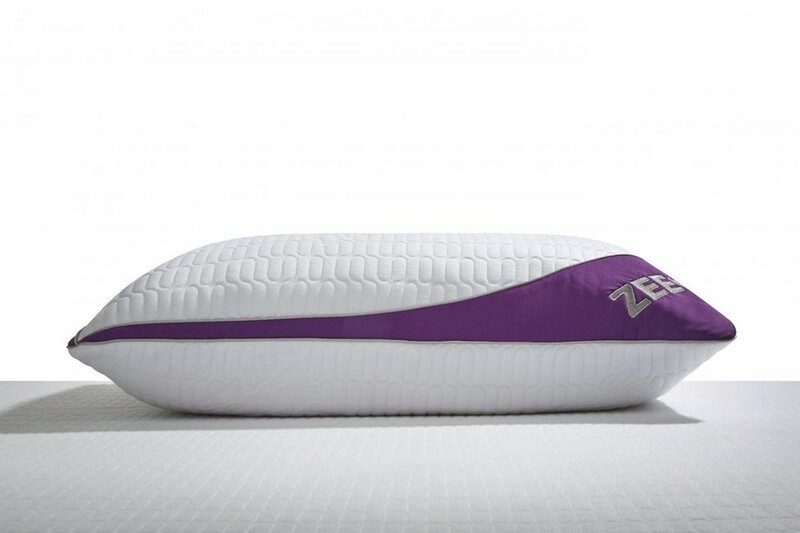 ZEEQ has 8 such speakers inside, which help it disperse the sound evenly throughout the pillow. 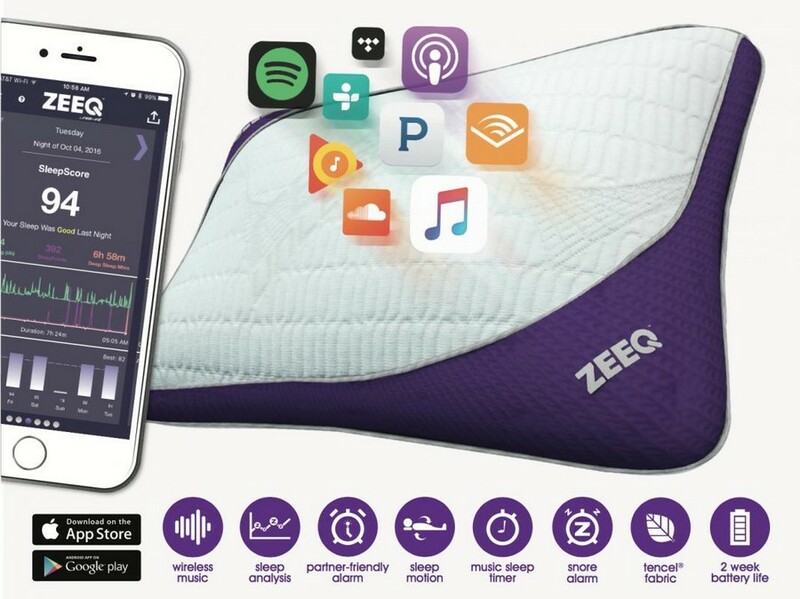 Being connected to a smartphone app, ZEEQ helps the user fall asleep streaming his favorite music tracks or audio books during the time he predetermines before going to bed. As soon as you fall asleep, the hardware built into the smart pillow starts analyzing your sleep, in particular your movement and sounds. This data is tracked and recorded throughout the night and can be analyzed via your app. But it’s not just recording the data, but responds to it smartly. For example, there is a Snore Alarm – a sensor that detects snoring with a sensitive microphone to the decibel level and as soon as it reaches a predetermined level makes the pillow vibrate. This in turn encourages the user to change the position and ensures a better night’s sleep for his partner. The traditional morning alarm is also designed with partner-friendliness in mind: it’s localized and silent and wakes only the smart pillow user. To crown it all you may opt for a Smart Alarm function. It works as follows: you set the alarm time before you go to bed at night, as usually. But you must have heard that our sleep has definite cycles and the phase of this cycle, at which we hear the alarm ring has a great influence on the way we will feel this day and our mood. The ZEEQ claims to be able to monitor the user’s movement during the night and wake him up at the most favorable moment, even if it’s a bit earlier than the predetermined alarm time. And of course, it goes without saying that a pillow should be comfortable. With comfort in mind the ZEEQ creators picked Tencel® Fabric for it. It’s a natural material made from cellulose extracted from the raw wood. As for the battery, it has to be recharged approximately once in a fortnight.